The psychology of an aged, long-imprisoned ex-grifter drives the more absorbing side of The Samaritan, David Weaver's indie crime-suspense film. 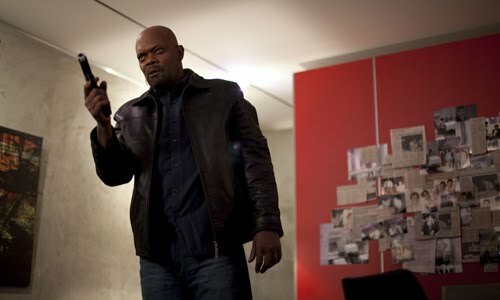 The story's been told many times before: Foley (Samuel L. Jackson), a weathered ex-conman with a dark past, reenters the world after a twenty-plus year stint in jail, where he underwent a change that turned his focus off conning others. He holds down a nose-to-the-grindstone job, shacks up with an equally-damaged woman, and avoids the business that stole a quarter-century of his life -- even though that side comes knocking on his door anyway, in the form of someone with an intimate connection to Foley's now-dead partner. Wouldn't you know it, he wants Foley for one last con, the mark a high-rolling crime boss (Tom Wilkinson) who'd set them all up for life. Reluctantly, with some introspection and distrust towards his "partner", he surrenders to his plot. That'd be a predictable but fine set-up, a deceptive house of cards, if the reason why Foley caves didn't cripple this vexing, thematically confused thriller. Sam Jackson does everything in his power to guide The Samaritan down a gripping dramatic path, giving Foley a rich, haunted soul that extends far beyond the character's limited depth. His embellished demeanor is restrained here, generating a deep simmer of troubled tension as the newly-released ex-con, where leather jacket-adorned strolls through the city and conversations with those links to his past accentuate Foley's burdened outlook. Jackson pulled me into the mental space of this weatherworn archetype through his bright-white eyes and liberated temperament, escalating as he rubs elbows with Iris (Ruth Negga), a drugged-up and sexually-willing vagabond shoved his way by the his ex-partner's son, Ethan (Luke Kirby), as an "incentive". Ruth Negga plays the girl with disarming empathy, to which she and Jackson develop a keen rapport; Foley begrudgingly defends her honor and drowns their melancholy in liquor, then their bond somewhat dubiously transforms into a Leaving Las Vegas-like affinity between dirty souls. Steeped in the world of con artists, false friends, distrust and volatility where past decisions echo years later, it's hard to resist involuntary suspicion towards everyone and everything around Foley; it's part and parcel with the world. That untrustworthiness bleeds into elements of The Samaritan, though, that require trusted therapy and validity for Foley's story to thrive on any genuine level, creating a divergence in David Weaver's film where he intends to raise red flags around every corner. From the moment Ethan shows up in his shadowed, empty apartment, he clearly harbors an agenda to bring Foley into a scheme by any means necessary. Soon after, a lost, suicidal addict -- once a leech on Ethan -- enters his life on the current of sexual desire and fixing someone that's broken, bringing him change and a sense of purpose. Is she a kindred spirit, or a puppet? That speculation works elsewhere, but not when you're trying to get your hands dirty with a redemptive ex-con's phoenix-like comeback into society. Despite its schizophrenic tendencies, The Samaritan does maintain a modicum of crime-thriller intrigue at first through its sledgehammer subtlety and thick noir-ish dialogue, where raw suspicion drives the plot's moving parts as thorny characters attempt to deepen themes of mistrust and recovery. Then, once Ethan truly pushes Foley's buttons in a grand effort of persuasion, it happens: a contrived, hollow twist in the story that single-handedly undermines most of the soundness present in David Weaver's intentions, driven only by pulpy shock value and a clear fixation on South Korean revenge cinema (all that's missing is a pair of scissors snipping out a tongue). Those elements of intrinsic growth built in Foley's weatherworn neurosis and his relationship with Iris fly out the window, replaced with a bemused and infuriating outlook on the whole situation -- one that was completely unneeded -- as a way of forcing the elaborate last-ditch con as a revenge-driven act of greed. The whole think smacks of coarse emotional exploitation, and we haven't even arrived at the halfway point yet. The follow-through after the twist in The Samaritan isn't without a few compelling turns once it gets to the con itself, borrowing cues from David Mamet's work and Stephen Frears' The Grifters, but it's really hard to shake the bad taste left from writer/director Weaver's rehash of a twist. A neat time-progression scene involves Foley preparing for the big event -- exercising, tasting wines, and learning a foreign language -- while turning full-circle within a slick high-rise apartment in the city, yet instead of really digging into the Sting-esque anticipation of the preparation and orchestration, thoughts linger about how his situation has been reframed in such a forceful fashion. Despite reputable performances, especially Jackson's low-bubbling rage and Ruth Negga's disarming and raw malleability, that perception only deepens with every schlocky return to the magnitude of that secret hot on Foley's heels, ending the story in a pool of blood, bullets, and dirty laundry that could've voiced more about salvation with a hell of a lot less.